As part of my American Classics recipe column over at Serious Eats, I've been seeking out regional ice cream recipes in honor of National Ice Cream month. 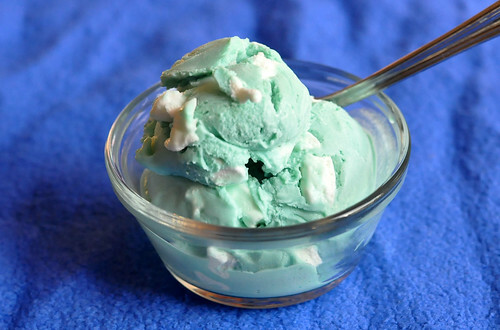 Last week I made Grape-Nuts ice cream and in my recipe research I stumbled across Blue Moon Ice Cream, a brilliant blue ice cream that tastes something like blue raspberry/bubble gum/cotton candy goodness. Hmmm...sounds like Smurf base to me. I couldn't resist. I took half of the batch of Blue Moon that I made and I folded in some mini-marshmallow pieces. Ooooh, yeah...tastes like the real deal. Smurf ice cream success. Now that's something that my seven-year-old self would have been seriously impressed by. Do you have a favorite regional ice cream flavor? Or a treasured favorite flavor from childhood? If you don't mind me asking, were you banned from watching all cartoons or just those specific ones? There was an ice cream shop named Taste the Tropics in Brooklyn and they sold a mix of regular and Caribbean flavored ice creams (ex: soursop, mango, rum and raisin, banana, grape-nut, pistachio, etc.). As a kid I loved their banana and rum and raisin. Excluding that shop, my favorites were regular ol' Haagen-Dazs chocolate, rum and raisin, mango sorbet, and raspberry sorbet. The name of the place has changed and there's also a bakery now. I visited for the first time in a long time a few weeks ago and the mango ice cream was sooooo good. I've been thinking about it almost non-stop since then. I just wanted you to know that Brownie watched a lot of cartoons growing up. I actually was involved in filmmaking and so Brownie ended up having kind of a cartoon critic for a mom. I grew up in california and In southern ca they make date milkshakes that are aaammmaaazziinnggg.